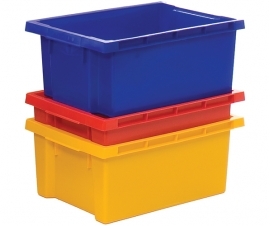 180º Stacking and nesting plastic containers nest inside each other when not in use and stack when full. The container's clever design requires a 180º rotation to enable them to either stack or nest. Maxinest containers are commonly found in supermarkets, grocery stores and farms. Their strong bale arms allow for crates to stack when raised and fold down to allow crates to nest when not in use. 180º Stacking and nesting plastic containers nest inside each other when not in use (saving you valuable storage space) and stack when full. The container's clever design requires a 180º rotation to enable them to either stack or nest. Perforated containers are available to allow air to circulate, these containers are a great solution for storing perishable goods such as fruit, vegetables, and other food items. 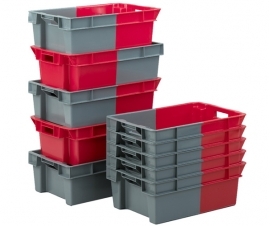 Maxinest containers (grocery crates) were developed and designed in consultation with major retailers and are commonly found in supermarkets, grocery stores and farms. Their strong bale arms allow for crates to stack when raised and fold down to allow crates to nest when not in use. 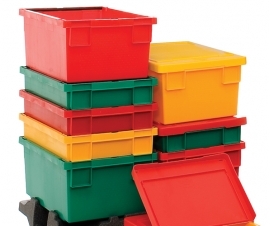 Maxinest crates also fit on to Euro standard dollies allowing for easy manoeuvrability. 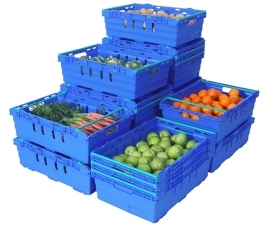 Maxinest crates are perfect for groceries and other food products, made from food grade polypropylene and fit virtually all display and distribution cabinets.